If life is a pageant, and work is your stage, a costume will help you play your role. Some days, a little severity is called for. That’s when I wear all black with a dash of white suggestive of the Puritans. The black is somber, but it’s the boots that make the outfit severe. It’s so obvious that I almost forgot to say it. If I were wearing flats, I’d look like a slightly scary schoolgirl or a really hip nun. If I were wearing heels, I might be a loan officer at the local bank. This outfit can be lightened, of course, by taking the jacket off or carrying a bright-colored bag. This outfit is easy to put together; you probably have all the pieces in your closet right now. The jacket and dress are not matching, but they coordinate nicely, and each has detail that prevents the outfit from looking flat. The jacket has a defined waist and top stitched pockets; the fabric is so thick that the top-stitching almost looks like trapunto. The dress has ribbon running down the princess seams. Note: The dress was not designed to be worn as a jumper. I bought a size larger than my usual size to accommodate a blouse or slim turtleneck sweater. 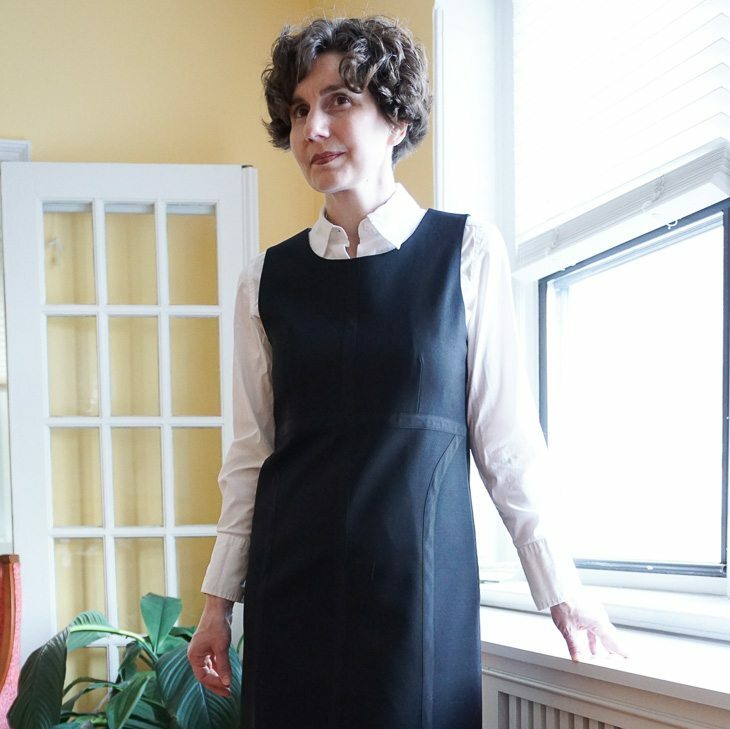 The dress had a pronounced a-line silhouette, but I had a tailor take in the side seams to make the skirt perfectly straight; because the dress was a little big all-over, the result was a straight silhouette that skims the hips. So off you go! Don’t forget the boots! I am LOVING this blog! So new, so fresh…and already I can see the value. I can’t wait to read more about your favorite stores, and perhaps (dare I say it?) the pros and cons of hiring someone to help you with your wardrobe. (Assuming, that is, that you’re unavailable due to some serious law-laying-downing.) If this blog is what I think it is, I may not need additional help after all. Can’t wait for more — thank you!